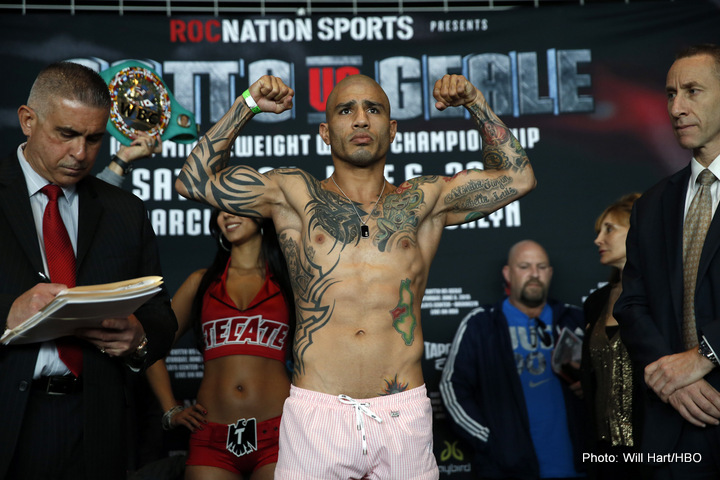 (Photo Credit: Will Hart/HBO) WBC middleweight champion Miguel Cotto (39-4, 32 KOs) came in really low at 153.6lbs at his weigh-in today for his title defense on Saturday night against Australia’s Daniel Geale (31-3, 16 KOs) at the Barclays Center in Brooklyn, New York. Cotto looked like he overestimated how much weight he needed to strip off in order to make his own 157lb catch-weight. By coming in lower than he needed to, Cotto kind of shot himself in the foot because he didn’t need to strip off nearly that much weight. Geale came in at 157lbs, and was fortunate not to have to go back to his dressing room to drain off more water weight. Judging by how thin Geale looked, he must have had to really struggle to get off the extra three pounds to make the 157lb catch-weight. 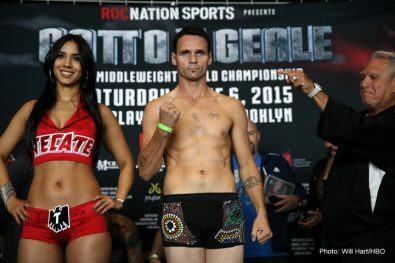 The good news is that Geale made the weight, and he’ll be the one facing Cotto on Saturday. There was a potential of Geale being replaced by an unnamed opponent at the last minute if he failed to make the 157lb catch-weight. You’ve got to give Geale a lot of credit for making weight for the fight because getting down to the catch-weight had to have been a major struggle for him. Geale is a legitimate middleweight who normally weighs in right at the limit at 160. Taking off extra weight was asking a lot of him. 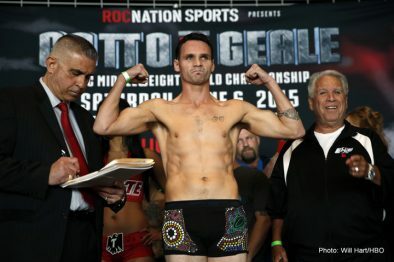 Geale will no doubt put on a lot of weight tonight and come out for the fight likely weighing over 170. 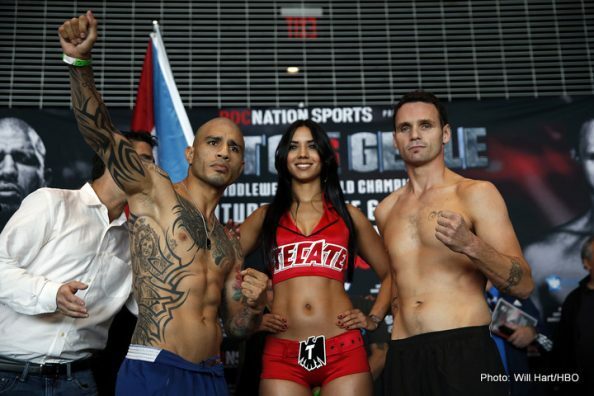 Cotto will be at around 160, and giving up 10-15 pounds to Geale. Cotto was at a weight disadvantage for his last fight against Sergio Martinez, and he proved that it wasn’t a big deal. That extra weight could be a real plus for Geale if he can survive the early rounds against Cotto. 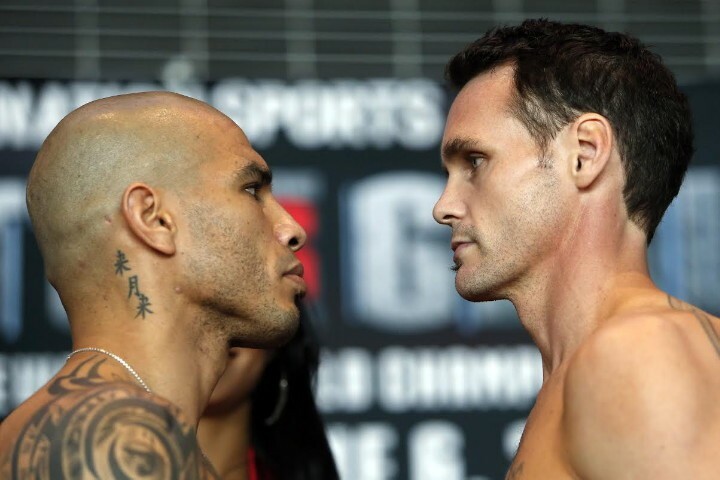 If Geale is able to nail Cotto a lot in each round, we could see an upset in this fight. Geale doesn’t need to have major power for him to beat Cotto. Just being over 170, and hitting Cotto frequently with head shots will do the trick for Geale. Geale is a significant underdog in this fight, but he’s quite capable of beating Cotto if he fights in an intelligent manner. Boxing fans seem to forget that Geale has looked superb in past fights against guys like Anthony Mundine, who is a huge puncher, Felix Sturm, Sebastian Sylvester and Roman Karmazin. Geale definitely is a very talented fighter and hard to hit normally. Gennady Golovkin had his way with Geale, but that was a very good fighter. Next boxing news: Is a Floyd Mayweather jr. vs. Gennady Golovkin fight possible?